Tacos need a revamp in America. Well, okay. A lot of food does, but tacos are the subject at hand. I think when most people think of tacos they imagine a cheesy, beefy situation that’s piled high with lettuce. There’s absolutely nothing wrong with that on occasion but trust me when I say that it’s not the best taco. It’s good, but you can do better. And here’s the revamp that I’m proposing, and I can’t believe I’m about to say this: Kill the cheese. A good taco doesn’t need cheese and in fact it can kind of get in the way if you use the wrong kind. Sometimes it’s good to go cheeseless. These fish tacos are a perfect example. There’s only three parts to these tacos and adding cheese to them I just don’t think would get you anywhere. 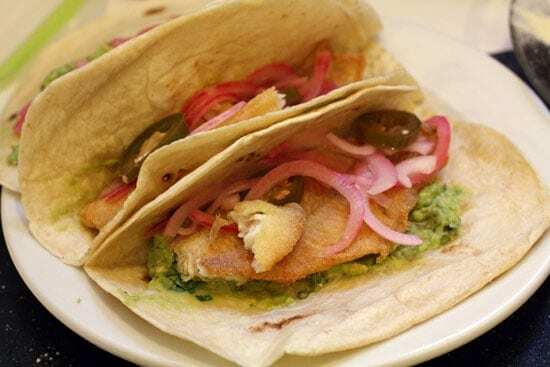 Catfish fillets lightly fried and topped with guacamole and pickled red onions. Perfect for a hot summer day! 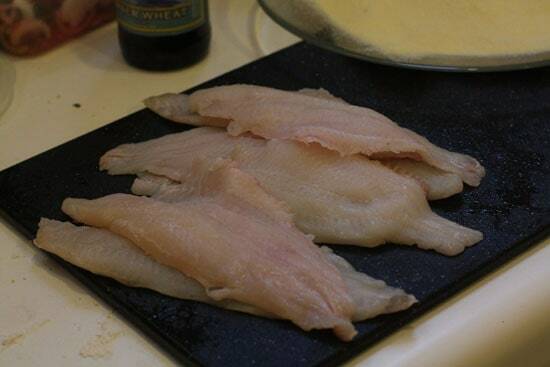 8 fillets of catfish (about a pound), or a pound of any flaky white fish. Cod would work. 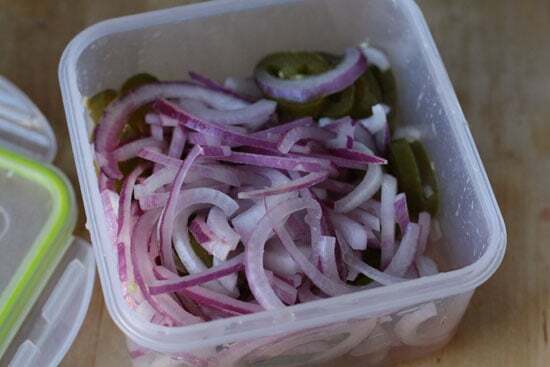 1) Slice red onion really thin and mix with brine from jalapenos and a handful or two of the chopped jalapenos. Mix with the lime juice and a pinch of salt and let marinate in the fridge for a few hours. 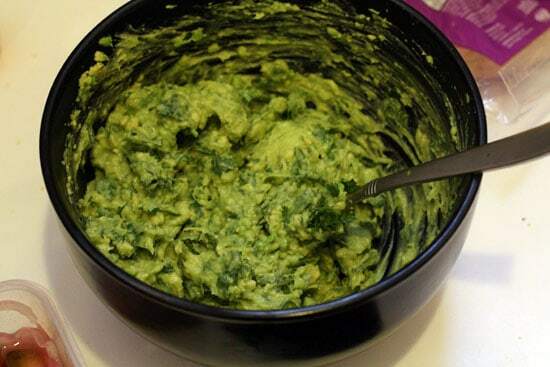 2) For guacamole, mix avocados and chopped cilantro (a few tablespoons) with the juice of 1/2 a lime. Don’ot make this too far in advance. 3) Put a thin layer of oil (maybe 1/4 inch thick) of oil in a cast iron skillet and get it going on high heat. 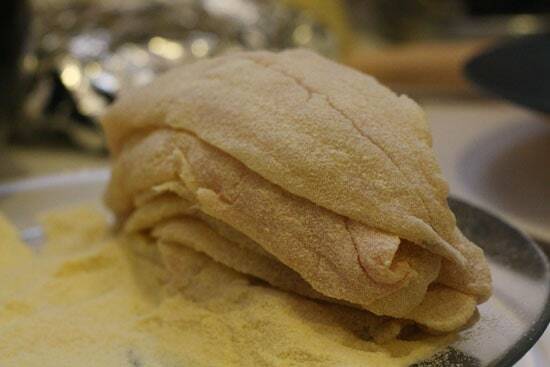 4) Dredge your fish in semolina flour or cornmeal. 5) Fry fish for about 3 minutes per side until lightly brown. Remove and let drain on a paper towel. 6) Heat tortillas for a minute or two in a 300 degree oven. 7) Assemble tacos and eat! My favorite part to these tacos was actually this really simple pickled onion mixture. You could make your own pickling mixture, but I just bought a jar of pickled jalapenos and used the juice from that along with some lime to lightly pickle the onions. It provided a real flavor punch to the tacos. Basic stuff, but really tasty. 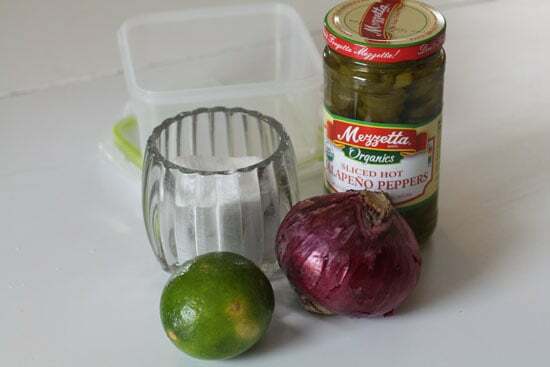 Slice your onions as thin as you can and mix them with about 1/2 Cup of juice from the jarred jalapenos as well as a few handfuls of jalapenos. Add the juice of a lime and a pinch of salt and mix this all together. This is best if it sits for a few hours before serving. I just mixed everything up in a plastic container and stored it in the fridge until I needed it. The guacamole for these tacos is really simple, but it’s important. 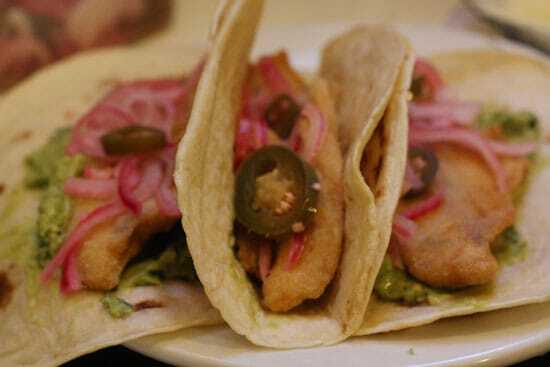 It adds a creamy texture to the tacos which is a good texture paired with the crispy fried fish and crunchy onions. Just mix together the avocados, some chopped cilantro (maybe 2 tablespoons) and a juice of 1/2 a lime. I used these perfect little catfish fillets I found. Each one weighs about 1/10 of a pound. They are a lot thinner than they look. They were perfect size for a taco. If you can’t find any catfish that looks good, you can use any white fish. Just cut it into strips that would be good taco-stuffing size. This are really thin actually. Perfect taco fillings. All I did to prep my fish was to dunk them in some semolina flour (cornmeal would also be good). It’s a very light coating, but I thought it was perfect. You don’t want anything too heavy for these tacos. I think semolina was a good choice. I added a small amount of canola oil to my cast iron skillet and got the oil hot. 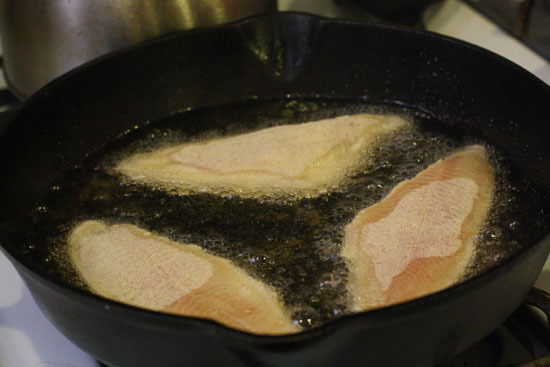 Once the oil is hot, fry a few fillets at a time. Due to how thin they are these fried really fast. About 3 minutes a side was all it took for mine. You really don’t need that much oil for these. I would guess maybe I used 1.5 Cups. As with anything you fry, don’t over-fill the pan. The fish shouldn’t be touching other fillets. Just a few minutes per side. 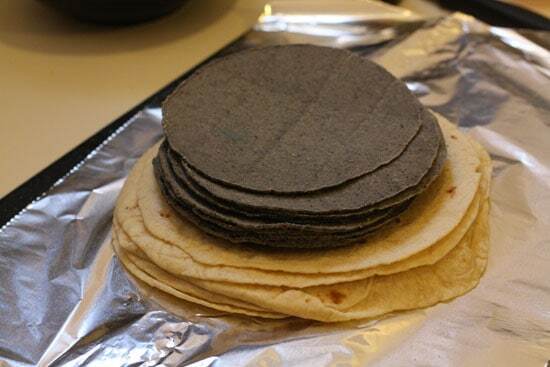 I tried two different kinds of tortilla for my version: Blue corn and flour. I must say that for these, I thought the flour was a better choice. I’d recommend heating up your tortillas by wrapping them in foil and sticking them in a 300 degree oven for a few minutes. I think you can see pretty clearly how to assemble these guys: Guacamole, fish, onions. I really dug these things. So there ya go. A cheese-less taco that I guarantee won’t have you missing the cheese. Like I said though, the pickled onions were my favorite part. I want to just keep a jar of those on hand for everything I eat. Have you had fish tacos before? Favorite fish for them? Leave a comment! These look wonderful. I completely agree about the cheese. But I do love a little Mexican crema — seasoned with cumin or not. Wow… Looks delicious. I am also in process of writing a fish taco post. However, mine is based on tilapia . I would share when it’s posted. Sorry, not a fan of catfish, but love everything else in the recipe. I think I’d use tilapia instead and add a few slices of tomatoes. “Kill the cheese.” Amen. I love cheese but it just isn’t necessary in a good taco. i normally use tilapia or mahi and blackened on the grill. shredded romaine and mango salsa as accompaniments. Mob member #1: No cheese? Heresy! Burn him!!!!! Mob member #2: Well…..he did use that nice jalapeno/red onion relish/salsa stuff, that was a nice touch. Mob member #1: But still, it's be a slow week, can't we burn him just a little? Nice job Nick. My favorite fish for tacos is the rare "chorizo fish".